Easy Bean & Beef Tostadas are taco spiced beef & refried beans layered on a crispy tortilla topped with cheese & fresh pico de gallo. Weight Watchers friendly recipe- 6 SmartPoints! By now, you probably have caught on to the fact that I make Mexican food at home at least once a week. It’s truly my favorite food to eat. The spices, the cheese, I love it all! One of my favorite things to make at home is tostadas. My Easy Bean & Beef Tostadas are a delicious and easy dinner made in under 30 minutes. Taco spiced ground beef and refried beans layered on top of a crispy tortilla. Topped with cheese and fresh pico de gallo! This is a Weight Watchers recipe and two tostadas are 6 SmartPoints. A while back, I discovered that I can bake corn tortillas and they crisp up perfectly. I always thought the only way to get a corn tortilla crispy was to fry them… so not true y’all! Mexican food is my favorite cuisine so I’m constantly figured out ways to lighten my favorite dishes up to make Weight Watchers friendly. When I figured out that I can bake a corn tortilla and make it into a tostada shell, my mind was blown! Once I figured out how to make a corn tortilla crispy, the recipe idea flood gates opened up. 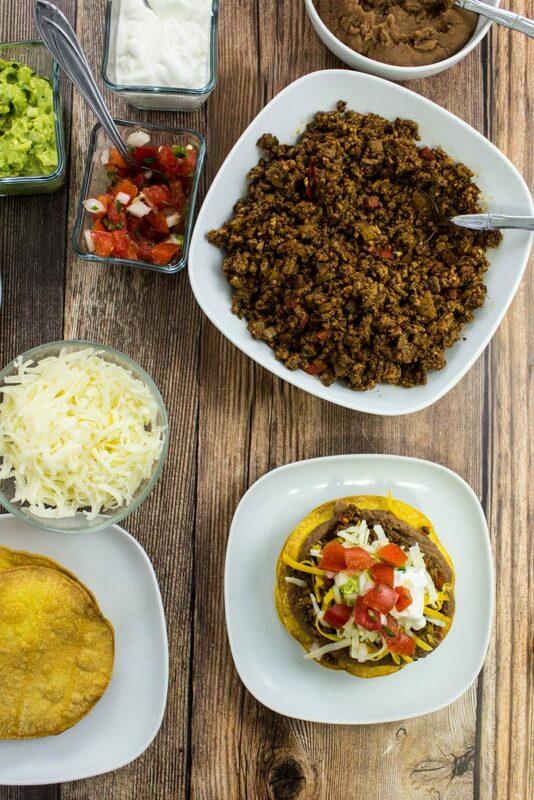 I make taco meat regularly so I knew the taco meat would be delicious as a tostada, rather than a traditional taco. Have you ever had a tostada? A tostada is a flat corn tortilla topped with beans, meat, lettuce, cheese, and guacamole. It’s basically a flat taco, so it’s delicious! If you ask my husband, he will say to skip the lettuce. 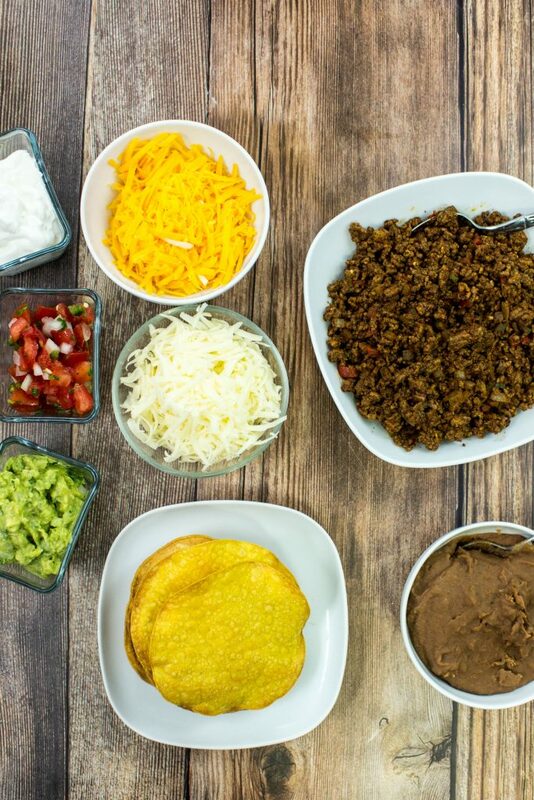 My Easy Bean & Beef Tostadas are just that… easy to make! To start, sauté onion, bell pepper, jalapeno, and garlic in a medium skillet for 8 minutes until the onion is translucent. Next, add lean ground beef, breaking the beef into small pieces, and cook for 10 minutes until the beef is fully cooked. Add tomato paste, cumin, chili powder, paprika, and cayenne pepper and mix well. 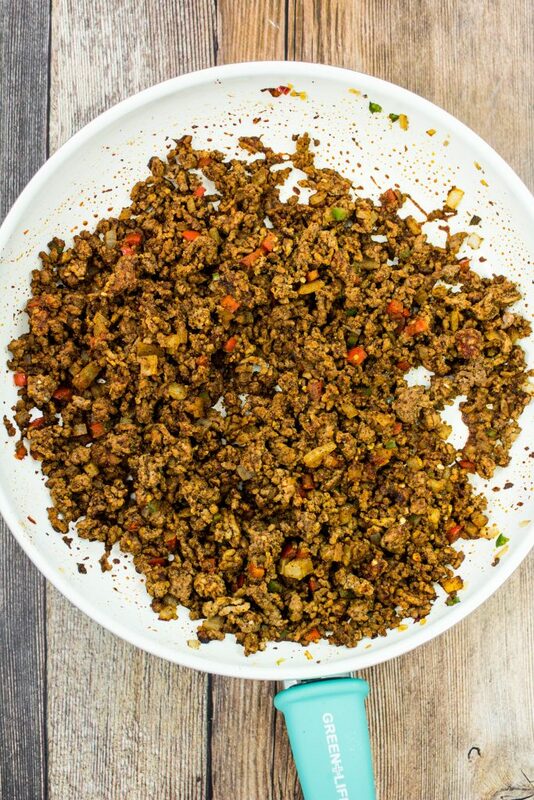 This is my basic taco meat recipe that I use for tostadas, enchiladas, and tacos! After the meat has cooked, cover with a lid and reduce heat to low to keep warm. To make the tostada shells, preheat oven to 400 degrees. Spray both sides of corn tortillas with cooking spray then lay onto a baking sheet. Bake the tortillas for 7 minutes, remove from the oven and flip the tortillas, then bake for another 7 minutes until tortillas are golden crisp. Once the tostada shells are cooked, it’s time to assemble the tostadas! Spread two tablespoons refried beans on top of a tostada shell, add two tablespoons taco meat on top of beans and set aside. 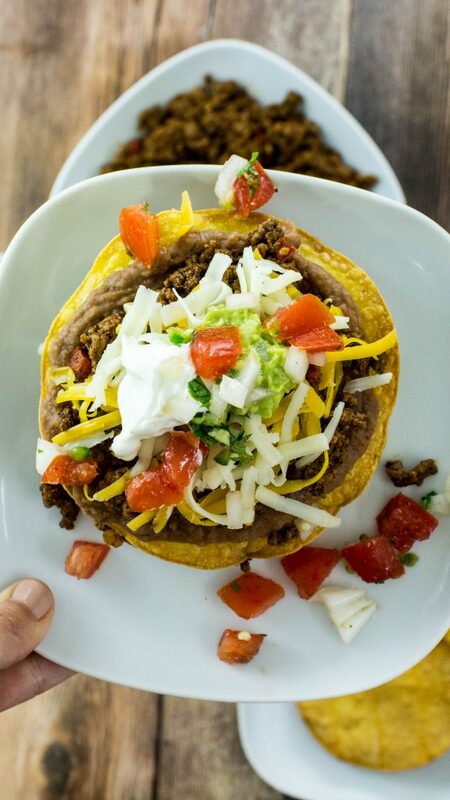 Spread two tablespoons refried beans on top of a tostada shell, add two tablespoons taco meat on top of beans and set on top of the other tostada shell. 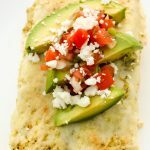 Sprinkle the top with one tablespoon of shredded cheese and garnish with pico de gallo. I like to spread a bit of guacamole and fat free greek yogurt on the top too! Easy Bean & Beef Tostadas are a delicious and easy dinner made in under 30 minutes. Taco spiced ground beef and refried beans layered on top of a crispy tortilla. Topped with cheese and fresh pico de gallo! 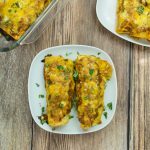 Mexican food made easy at home!! Guaranteed to make anyone’s belly happy 🙂 . Weight Watchers friendly with 6 SmartPoints for two tostadas. Dice onion, bell pepper, and jalapeno and set aside. Heat medium skillet over medium heat and add olive oil. Add diced onion, bell pepper, and jalapeno. Sauté for 8 minutes until onion is translucent. Add garlic, season with 1 teaspoon salt and 1 teaspoon pepper. Sauté for 1 minute. Add ground beef, break up into small pieces, and cook for 10 minutes until meat is fully cooked. Add tomato paste, cumin, chili powder, paprika, and cayenne pepper. Mix well. After the meat has cooked, cover with a lid and reduce heat to low to keep warm. Heat a small pot over medium low heat and add refried beans. Heat for 5 minutes or so until beans are warm. 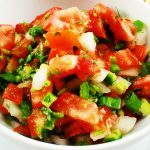 Make Pico de Gallo according to recipe instructions. Spray tortillas with cooking spray on both sides. Lay tortillas on baking sheet and bake for 7 minutes. Remove from oven, flip over, and bake for another 7 minutes until golden crisp. 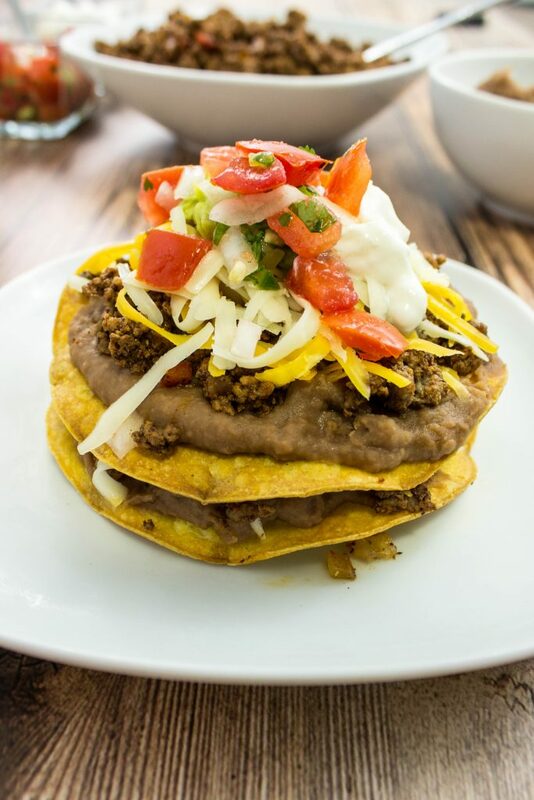 Spread 2 tablespoons refried beans onto a tostada and add 2 tablespoons ground beef on top of beans; set aside. 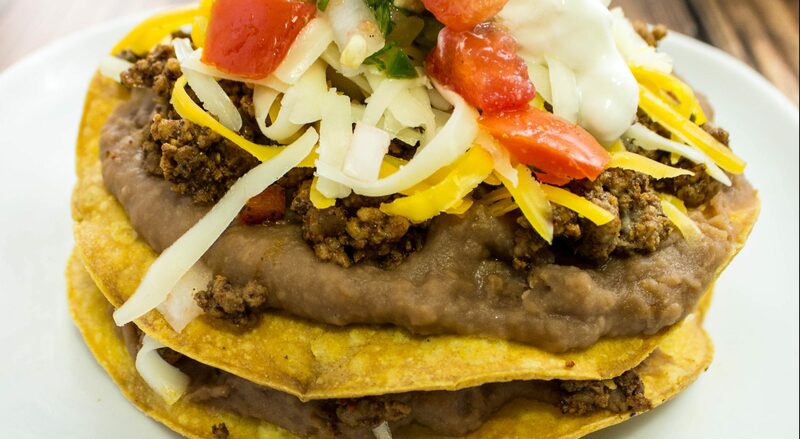 Spread 2 tablespoons refried beans onto a tostada and add 2 tablespoons ground beef on top of beans. Place tostada on top of other tostada and sprinkle the top with 1 tablespoon cheese. August 11, 2017 at 10:04 am Looks delicious:) my boyfriend and I always make toastados at home! August 11, 2017 at 3:55 pm I love simple recipes like this that are healthy and easy to cook in 30 minutes! I'll have to try this one next week. August 14, 2017 at 9:14 am I hope do try this soon Nellwyn! August 11, 2017 at 7:53 pm Looks delish!! A nice change to our usual taco night! August 14, 2017 at 9:14 am Thanks Melissa! August 11, 2017 at 11:12 pm These look so yummy! Need to try. August 14, 2017 at 9:13 am I hope you do try Jenny!! August 11, 2017 at 11:23 pm Mmmm! I also LOVE Mexican food! We make some form of tacos at least once a week! I'll throw this into the rotation. Thanks for sharing! August 12, 2017 at 9:05 pm This is perfect! I was looking for a tostada recipe! August 14, 2017 at 9:12 am I'm so glad you found this one Keri! 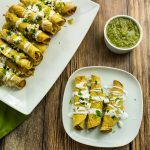 August 12, 2017 at 11:53 pm These looks so delicious, I think I have everything I need to go make this now! August 15, 2017 at 9:44 am Oh wow Katie! Thank you SO much!!! August 15, 2017 at 9:44 am Thanks Sophia! I hope you do make it! November 3, 2017 at 11:34 am OMG! We had a blast with these tostadas. They're so good. Thank you for sharing this recipe. November 5, 2017 at 8:51 am I'm so glad to hear! They are so fun to make and to eat! !